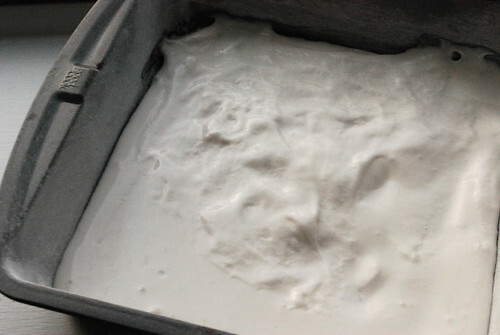 Recipe: Marshmallows! | Dinner Love. I know you were probably hoping for cheese. Sad day. But I got distracted yesterday when I realized that I had all of the ingredients for marshmallows in my cupboard (yeah, this is what happens when you cook a lot. You end up with random bits of foodstuff, like envelopes of gelatin and corn syrup from that one time you made that cake/pie/candy thing). So as I was saying, I was sitting around thinking about how much I wanted some hot chocolate, but we all know that hot chocolate isn’t really worth it unless you’ve got some whipped cream or at the very least some marshmallows and I didn’t have either of those things and I didn’t want to go to the store. So I lay despondently around in total depression (tiny violin playing in the background) until I remembered that I could actually make my OWN marshmallows. This is the full recipe, but I actually cut everything in half. I also stole the recipe from Alton Brown. It’s ok though, he’s used to it. Nonstick spray, or olive oil. 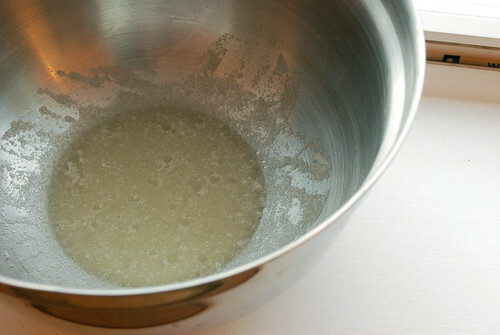 Put the gelatin and half of the water in a large mixing bowl. Mix the corn syrup, sugar, salt and the rest of the water in a saucepan, cover and heat over medium-high heat for 3-4 minutes. 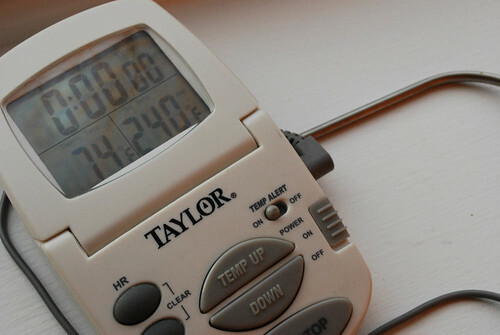 Uncover, and using a thermometer heat the mixture to 240˚ F. I used my super-spiffy meat thermometer. You can do the same, as long as you have a thermometer that goes up that high. You just have to be careful that the thermometer tip is not touching the saucepan at all, or it will mismeasure the temperature. I employed the use of a rubber band. Once the mixture hits 240˚, take it off of the heat immediately. While you wait, grab a pan (mine is 8″x8″) and grease it all over using the cooking spray or olive oil. 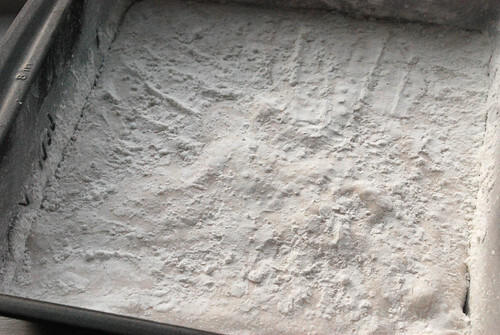 In a separate dish, mix the cornstarch and powdered sugar. Coat the pan using the cornstarch mix, and reserve the leftovers for later use. Now, you’re going to combine the gelatin with the sugar mixture by slowly drizzling the heated sugar mix into the gelatin, while you constantly whisk it all together. This is super-easy if you have a stand mixer. I do not. In fact, I don’t even have a hand held electric mixer, so I used my whisk and MY HANDS. My shoulder kind of hurts, but I have fabulous muscles. 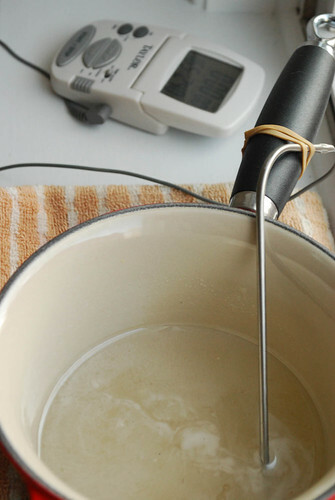 Any way you choose to mix, it takes between 10 – 14 minutes to reach the correct consistency. It will get really fluffy. 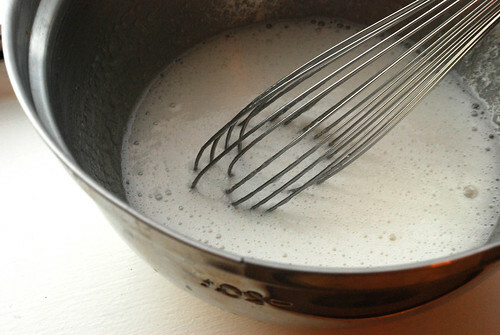 And then, it will start getting super-glossy and very difficult to whisk. That’s about when it’s done. 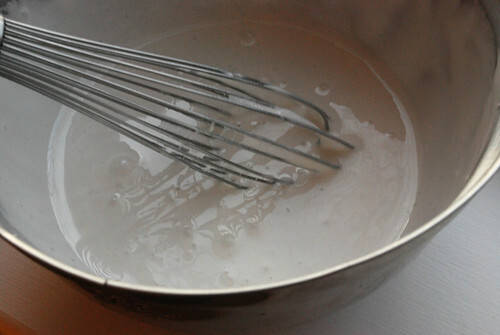 You want to add the vanilla in the last 2-3 minutes of whisking. Pour into your prepared pan, using an oiled spatula (or spoon, what have you) to evenly distribute. Sprinkle the top with enough of the cornstarch mix to cover, again reserving the rest. Let the marshmallows sit uncovered for at minimum 4 hours. 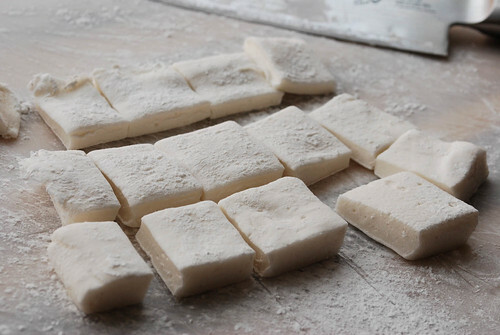 Once this time has elapsed, turn the marshmallows out onto a cutting surface and cut into squares. You might need to coat your knife with some of the cornstarch mix. 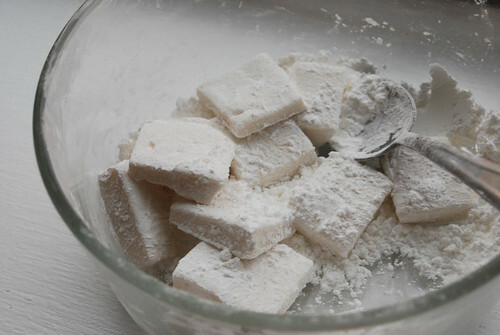 Coat the cut marshmallows with the remaining cornstarch-sugar mixture. 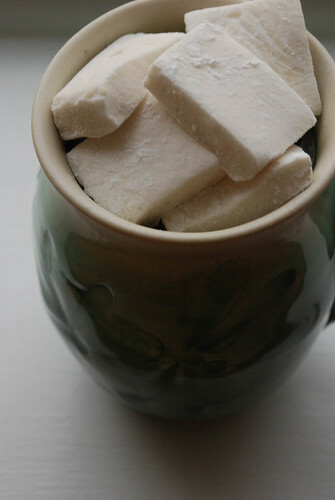 You can store the finished marshmallows in an airtight container for up to three weeks. Enjoy! ← The Cheese Kit Cometh!